FetchThat: Beware wLinkster is here : Zuck it! So we are back again with some more news. At an ongoing survey on the internet, FetchThat Team looked of an old post from Mark Zuckerberg. Yeah! The founder of Facebook. At the glance on one of the posts of Mark, We found something related to privacy and get an eye on the wLinkster and it's developers. So and we being to inspect. 1) Website is hosted on Hostgator Servers (in India) [That doesn't mean that HostGator doesn't have good hosting it depends upon how website is created) which makes the website load very slow. 2) The design of the website is the copy of Facebook with approximately 92% of it's code using a pre-build script and 10% included exceptions. 4) The chat system and functions for downloads used in the website is powered by Envolve. 5) The feature of chat also includes an inbuilt ad system to provide reference to free website creations. 6) The website uses Skysa App Bar to provide quick links and other information to attract the users. 7) They tried to put up their Official Wikipedia Article which used named as Inc. which was quickly removed too. 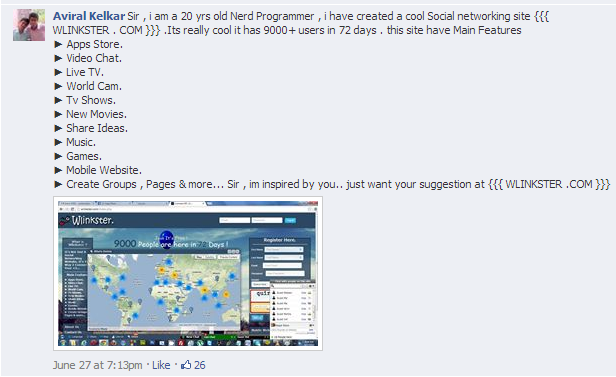 1) The website owners except Sagar Rana (Profile ID 1) doesn't have their own profiles on the website. 2) Most of the user accounts on the website are fake or spam. 3) They don't have security related to registration as well as user data and information. We can easily view any users details (Email ID, No., Country, IP) from the user profile link. We still wish them best of luck for future to work with it more.